123 is using Smore newsletters to spread the word online. 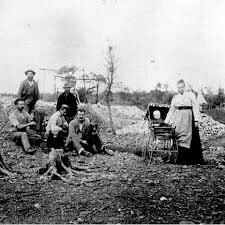 Life on the goldfields was very difficult because it was very hard to find gold.And only Sometimes if you were lucky you could find gold but most of the time you would not be able to find gold. It was also very hard to provide for there families because sometimes they would get sick. The poor ladies would be cleaning ,cooking and working all day like a machine. They would also look after children while the men struggled to find gold in the hot conditions. When the men have finished mining they would come home very exhausted ,hungry and dirty and upset because they did not find any gold . Food was very hard to get in the goldfields .They usually had to eat mutton and damper but only if they were lucky they could eat . But sometimes they did not have anything to eat and they would starve to death. women were as hardworking as the men they would clean,cook and look after there children they would also entertain the men to cheer them up . there were many types of techniques of mining such as a cradle,windglass,pickaxe,shovel,pan,sluice,chishlom and a puddle. 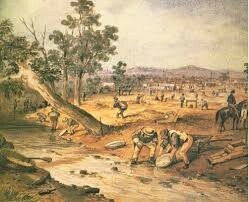 in the goldfields they would usally eat damper but only if they were lucky they could eat mutton.